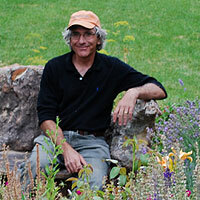 JAY MARKEL, founder and lead designer, has a four-decades career in art and landscape design. Jay began as a sculptor, and after years of building extensive small-scale models of monumental pieces, he discovered that landscape architecture was the natural outgrowth of this work. In Jay's words, "Landscape architecture expresses sculpture as an enveloping space ... rather than an object-oriented construct." Already an established artist, Jay embarked on a five-year working apprenticeship with Zen Buddhist monk Martin Mosco, of Marpa and Associates, and feels grateful for the opportunities and teachings he received there. Jay's sculpture can be found in several noteworthy collections both in the United States and in France. He has frequently taught, lectured, and served as a visiting artist. His work reflects a profound connection to the living earth and he has embraced environmental stewardship throughout his career. Nova Scotia College of Art and Design, MFA. VIRIDITAS has won a Merit or Grand Award for every garden submitted in the ALCC Excellence in Landscape competition. We are proud of the expertise of our highly skilled crew which over a fourteen-year period has helped to develop proprietary construction techniques that are the hallmark of theViriditas design aesthetic. Showcase gardens have been a part of human history since the 6th century BC with the Hanging Gardens of Babylon, one of the Seven Wonders of the Ancient World. Some historians believe that the perfect proportions of the earliest Greek buildings reflect the translation of gardens into grand public architecture. Gardening—growing crops—is at the heart of the development of civilization. Gardens appear as metaphors of spiritual growth in many religions. And so, the garden as a work of art exemplifies a consistency of vision within world-wide traditions. When I was living and working in France, it was interesting to me that my work was acquired—by substantial French collectors—despite or because of the fact that as an American I was not bound by any great sense of historical tradition. Not creating in the shadow of a long and celebrated history can be quite liberating for a contemporary artist. This newness of vision is very much a part of my garden designs for Viriditas. We utilize ancient landscape principles and classic techniques and transform them for today's luxury gardens. For example: my client may not have a 2,000 acre estate a la Versailles, but may in fact want a garden with the aesthetic of the formal French Garden, updated for the 21st century. Another example: Viriditas created the Green Pearl Dragon garden that features an illusion of ancient rocks that actually are freshly-blasted granite boulders. Working on that project, I learned about the technique of sand and water blasting on boulders to age them. (There are huge tumblers used in Japan for just this reason, but none has the depth of grain, edge or form details of our rocks.) I was asked by the client how our work expressed an Asian tradition. Knowing that what we had created wasn't a duplication of a traditional Japanese garden, the only response I could think of was, "This is how they will look in the future". That didn't come from an overestimation of my work, but from what we can see when traditions intermingle and advance. It happened when artists fleeing the war in Europe were able to create a new modern art in America. Working with skilled European, Asian, and Middle Eastern craftsmen, Viriditas creates exciting contemporary versions of age-old arts and artisan traditions: chateaux and winery gardens, Japanese and Chinese gardens, Tuscan and Mediterranean gardens, gardens that would be at home in the South of France, and gardens not yet envisioned. We use cutting-edge materials and our own innovative, proprietary techniques. We never know the exact how or why of changes in art. It is usually in retrospect than historians get intellectual perspective on profound, visceral changes. But in America today we're witnessing the rise of luxury home gardens—gardens 'as art' in a country with no previous tradition of this — and seeing great gardens being built as an expression of culture and refinement and connection to the earth. At Viriditas, we approach each garden as a unique work of art. And each garden should be beyond my client's imagining, or I haven't worked my magic. Thank you for your interest in our work. We hope we can serve you in the future.